In a flyfishing world which many times focuses on hatches, learning particulars about the hatch in question has always been one of the primary keys to success. Flyfishing Alaska is consistent in that respect; where it varies and is unique may be in the substance of the "hatch." Alaskan waters provide fish with many of the same aquatic insects that are present in waters throughout North America, although comparatively, hatches are generally smaller and less diverse. In many waters, commonly recognized hatches may be absent or inconsequential falling in the shadow of Alaska's "blanket hatches" of eggs and flesh. Both are by-products from millions of returning salmon which congregate in freshwater streams; similarly, they carry timing and substance to rival the most prolific hatches of more southerly waters. Eggs have remained a focal point of anglers pursuing northern fish; however, flesh is routinely viewed as an oddity and mistakenly overlooked by anglers making fly selections. Fishing with a flesh imitation may seem unusual, but to resident fish, birds and mammals, salmon carcasses are an absolute life sustaining staple and a key element to the survival of the species. And from an angling perspective, salmon flesh may be more substantial than the egg we've come to associate so readily with for flyfishing in Alaska. As the salmon enter their chosen streams and begin the spawning process, the eggs are one of the first big feeds of the new season for waiting residents. The magnitude of this occurrence cannot be underestimated, however, eggs are produced in limited quantities by only half the spawning salmon - the females. The five species of returning salmon may have different run timing making eggs available over a period of time, but the actual duration that eggs are available is relatively limited. In contrast, all salmon will produce flesh, introducing 100% of their body mass into the ecosystem. Flesh becomes available when the early run fish begin to die, and will be very abundant in late summer through fall until freeze up. 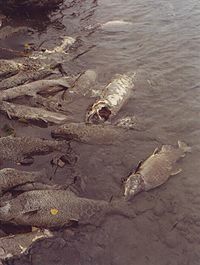 Streambeds remain littered with carcasses that fish will continue to feed on well after the surface has frozen, and countless salmon along riverbanks become effectively preserved in ice until the following spring when thaws and increased water flows re-introduce salmon flesh to river residents. Eons of time and the high nutritional value of salmon flesh have ingrained an instinct in resident Rainbows and others to feed on carcasses voraciously. These fish have an uncontrollable driven need to feed heavily on this food source any time it's present. What this means to the flyfisherman, is the opportunity to present an imitation while fish are feeding heavily on the natural. Odd or repulsive as the flesh concept may seem, what better situation could an angler hope for. From a tactical standpoint - for us to accurately imitate a natural, it's important to understand not only what is hatching, but also the cycles, nuances and behavior of the natural. So how do you imitate something as abstract as a tattered piece of dead fish? Well, like other hatches, the first thing we need to do is identify the natural. Flesh is not necessarily just flesh - it varies. The biggest variation in patterns lie in color. When salmon first enter fresh water, the color of their flesh ranges from pale orange to deep red depending upon the species. Shortly after their exit from the salt, physiological changes begin to occur resulting in metamorphosis that leave fish with little resemblance of their former selves. During this change, the flesh begins to pale and soften leaving the older fish with mushy white meat that will only be suitable for animal consumption. Then, after the fish has expired and begun to decompose, the flesh will continue to bleach from the elements. This will be the primary object of our imitation - dingy gray or white. The notable exception to this presents itself in certain high-pressure fisheries. Where easy angler access and strong salmon runs meet, there will be a slaughter. Thousands of bright, fresh fish may be caught each day, with cleaning done on the bank or at fish cleaning stations, with the scraps being deposited in the river to wash downstream. A veritable chum line develops and these areas become feeding stations for resident fish. An imitation to be used in these areas should possess the orange salmon color of fresh flesh. Presenting our fly to the fish is accomplished by "dead drift nymphing." Most fly fishers are familiar with the necessary techniques, but few nymphing situations will require more of the angler to assure a true dead drift. To appreciate the rationale behind a diligent dead drift, we can compare flesh with the imitations that are commonly used. Because emerging insects are alive and moving, there exists a small, acceptable margin of error. If our line drags a little, it may pull the fly toward the surface, imitating a phase of the emergence and still be effective. Flesh on the other hand, is inanimate - every feathery detail of movement is dictated by the will and whim of the current. A less than optimally presented fly will take fish, but the more naturally a fly moves in the water will reflect the number of strikes an angler will receive. As in all fishing situations, the areas fish will be holding will vary with the water conditions. Generally speaking fish will take holding lies which deliver the highest concentration of food with the least amount of expended energy. Because flesh is dependent upon current for movement downstream, the areas of greatest concentration will be where riffs run into pools, deep water tails out, and slow water meets fast, although my most productive and favorite situation is near the dead falls, sweepers and log jams. Many Alaskan streams are strewn with deadfalls - these areas are prime. Snarled branches form a strainer, effectively catching and holding salmon carcasses as they drift downstream. Carcasses pile on top of one another as the water pressure forces them further into the deadfall, never to come out again in one piece. Over time, the relentless force of the stream breaks the carcasses into small enough pieces to pass through the filter of branches. Flesh will continue to trickle from the sweepers for prolonged periods of time forming a feeding station for hungry Bows and Char. The beauty of this situation is that there's no place in the river a big bow would rather be than deep under the protection of deadfall timber. This combination of protection and a consistent food supply makes for "Hog Heaven." Fishing the deadfalls can be tricky. The fish won't go far from their comfort zone - they don't need to. Get a drift through the slot with a white bunny leech and there's almost a guarantee. There's one obvious catch though - I mean snag. I've been plagued by the dilemma, knowingly making casts, setting drifts that I knew were in trouble if a fish didn't hammer the fly in the first few feet. Losing a dozen flies in ridiculously short stretches only to reach for another - why? Because the fish are so long, so fat and broad across the shoulders, and run, leap and fight with a wildness I've never experienced in another trout. These fish are in the prime of their lives after a spring feeding of smolt, a summer of eggs and the proceeding weeks of flesh. They're pristine, immaculate and huge. To every problem there is a solution. How hard could it be to work through a snagging problem? 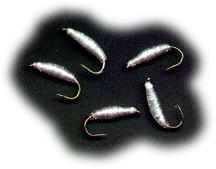 Simple - tie weedless. I've begun tying a weedless version using mono that allows me to probe deep into the jams with a substantial increase in not only my recovery rate, but also more importantly my success rate. If tree branch type resistance is felt while drifting through dead-fall areas, pull slowly working the fly back the way it came, then once free, allow it to continue it's drift, then hang on. Fishing flesh really is an odd, uniquely Alaskan event, but the concept will be quickly appreciated when the flesh hatch is on. Salmon carcasses are very prominent in and of themselves, but their presence also creates another situation that is worth considering. Frequently carcasses above the water line become maggot infested. This writhing mass of maggots takes on the profile of a salmon and is disgustingly impressive. Rain, fluctuating water levels and boat traffic wakes all contribute to these larvae being washed into the river which creates another hatch of sorts. Maggots are easy to imitate and their presence should not be ignored if taking trout is the objective.